Over the last three years I've become more of an adventure cyclist and bike commuter, and my racing years seems like a memory from the past. This year, I rode the real deal for the first time, Tahko MTB, but I wasn't 'racing', I just enjoyed the greatest cycling event in Finland in a great company. From 2003 I have rode every year the Finlandia MTB / Merida MTB Finlandia. I rode it in 1999 too, but the route and organizer were very different back then. 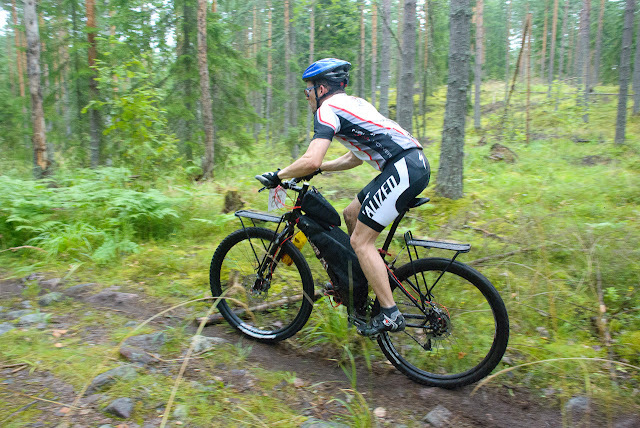 It was clear to me that I will ride it again this year, because it was to be my 10th Finlandia. Every time I have ridden the longer race class, two 35 km laps making it 70 km. I really like this event and the race course, and althought I haven't been in serious racing form in recent years, it's always nice to see if I can ride the last three hard climbs in the lap. This event has been very lucky with the weather. It hasn't rained in any of the years from 2003. In 2004, when the event was held in late September, the course was really wet, muddy and tough, but it didn't rain. The weather forecast for the event day (Sunday 19th of August) was all over the place during the week, so it looked that this time it really could rain. And in the morning it indeed rained, but the rain stopped right before the start. 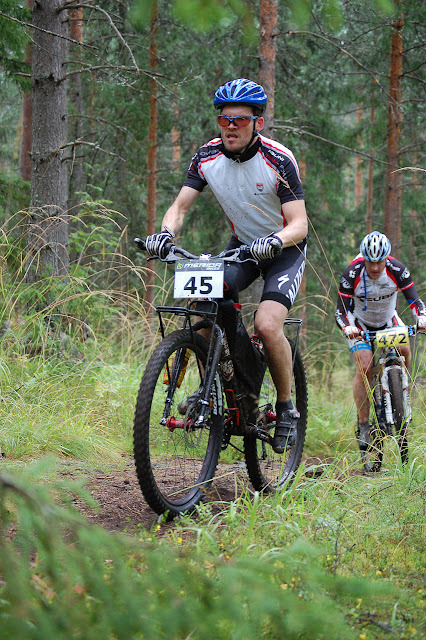 I was riding, of course, with my beloved 907 in 29er setup, and my plan was to just ride to finish without injuries. After Tahko I only did one longer ride, and overall my bike commuting has been my only training. So no big expectations. The first lap went fairly well, but I knew I wasn't very fast when the top guys of the 35 km start went past me. 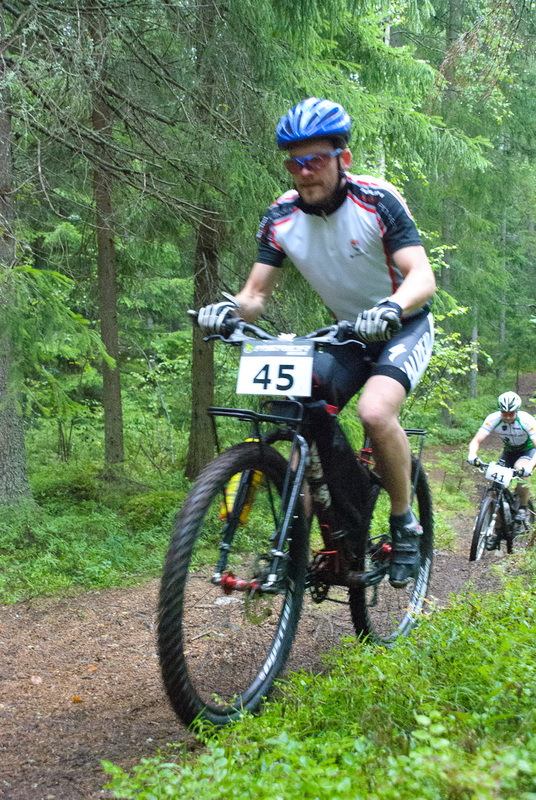 907 with 29er wheels was really a blast to ride. Absolutely great. I knew also how to gauge my effort because the last 10 km of the lap is the hardest. I also stopped at every service point (2 in the course, 1 in the finish line). 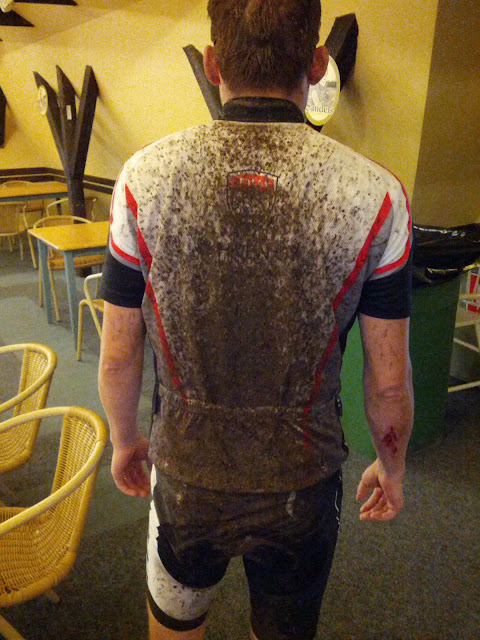 Somewhere at the 20 km point it started to rain, and at times really heavily. Epic! I really surprised myself by riding the hard climbs all the way, and I was really determined for the 2nd lap. And what a 2nd lap it was! The conditions were ridiculous and insane. All narrower trails transformed to tiny streams. Before the event I was about to change the tires, from Panaracer Rampage 2.35" to Continental Mountain King 2.4". Fortunately I didn't, because all the grip was really needed. And those Rampages really worked well in these conditions. But about 10 km to the finish the grip wasn't enough and I wasn't careful enough. 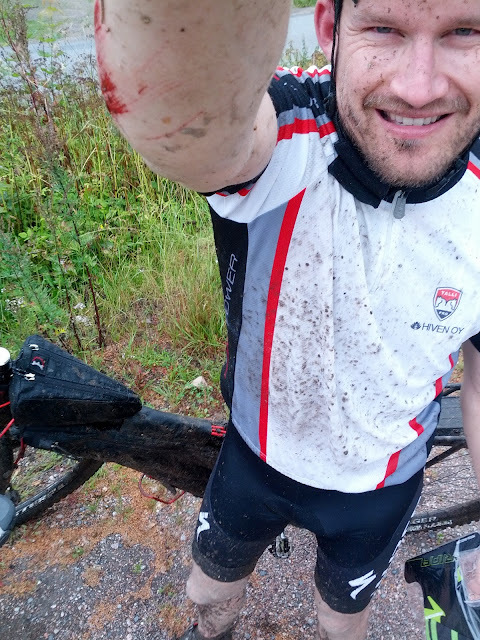 I fell on one technical descent, hitting my right arm but fortunately not seriously. Crossing the finish line felt great. This was definitely one of the hardest Finlandia, and I'm really happy that I have been able to ride this event for 10 times. I had my smartphone running Sports Tracker, to see afterwards how my riding went, although the time was pretty irrelevant. My official finishing time was 5h31min35sec, which is the slowest I have ever done in this event, but actual riding time was 4h57min31sec.